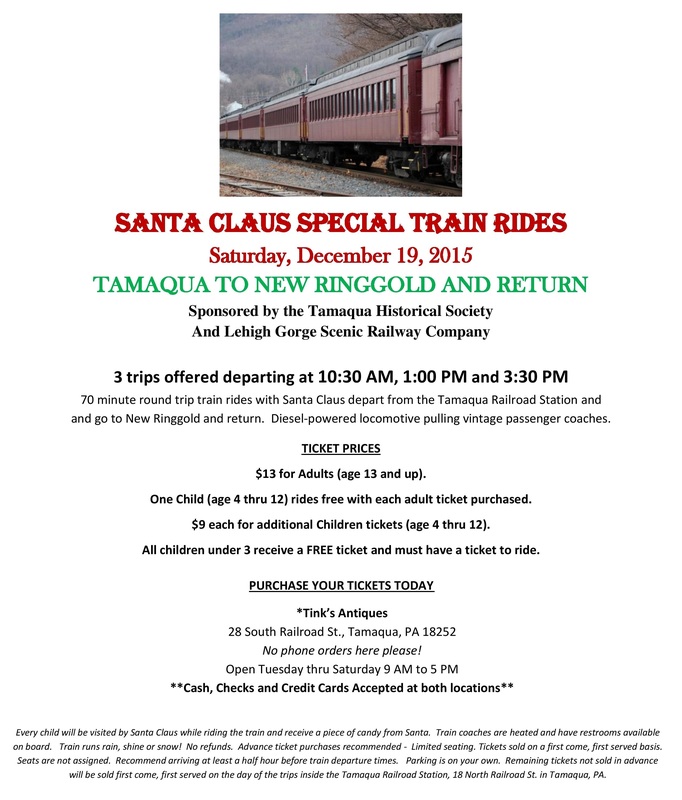 The Tamaqua Historical Society is selling tickets for their annual Santa Claus Special Train Rides scheduled this Saturday, December 19, 2015. Tink’s Antique Shop, 28 South Railroad Street, in Tamaqua is the only location to buy train ride tickets. They are open Tuesday thru Saturday from 9 AM to 5 PM. Cash, checks and credit card purchases accepted for tickets. Starting at the Tamaqua Train Station, each 70-minute round-trip ride with Santa will travel south to New Ringgold and then back. Riders will sit in vintage passenger coaches as they are pulled by a diesel-powered locomotive. Rides depart at 10:30 AM, 1:00 PM and 3:30 PM. The rides are sponsored by the Tamaqua Historical Society and Lehigh Gorge Scenic Railway Company. – $13 for Adults (age 13 and up). – One Child (age 4 thru 12) rides free with each adult ticket purchased. – $9 each for additional child (age 4 thru 12). – All children under 3 receive a FREE ticket and must have a ticket to ride. No phone orders here please! Every child will be visited by Santa Claus while riding the train and receive a piece of candy from Santa. Train coaches are heated and have restrooms available on board. Train runs rain, shine or snow! No refunds. Advance ticket purchases recommended – Limited seating. Tickets sold on a first come, first served basis. Seats are not assigned. Recommend arriving at least a half hour before train departure times. Parking is on your own. Remaining tickets not sold in advance will be sold first come, first served on the day of the trips inside the Tamaqua Railroad Station, 18 North Railroad St. in Tamaqua, PA.